Interested in buying a pair of waders for your next duck hunt in 2020? Here are a few things to look for that will help you choose the right one. Duck hunting waders have come a long way since the early days. High-tech materials like neoprene, Gortex, and Thinsulate provide a barrier of protection to keep your dry and warm on even the coldest days in the field. But it doesn’t end there; duck hunting waders are more durable than ever too. The best duck hunting waders are made with waterproof seams, reinforced zippers, and extra protection like knee pads and thigh guards to protect against brush and other abrasive objects. With these factors in mind, we’ll review some of the top duck hunting waders available that will serve you well on your next hunt. Staying dry while hunting is one of the most important aspects to prevent being miserable in the duck blind. We’ve all had waders leak and it can be extremely frustrating and even lead to hypothermia. Picking a dependable pair of waders may be the most important factor when preparing for your next duck hunt. Drake MST Eqwader 2.0 Waders (click to check the current price on Amazon) – Drake is well known in the wader industry and I’ve been happy with every pair I’ve owned. I can usually get 4 years of use out the Eqwaders before they need to be replaced. Cabelas Ultimate II Hunting Waders (click to check the current price on Cabelas) – The Ultimate Hunting Waders are my go-to neoprene waders for really cold conditions. These waders have never let me down in freezing temperatures or while standing in waist high water all morning. Lacrosse Super Brush Tough Waders (click to check the current price on Cabelas) – Lacrosse has built a cult like following and it all started with the Super Brush Tough product line. The Super Brush Tough make great early season waders when the weather is still mild. When you sit down and compare the Ultimate Hunting Waders to the Drake Eqwaders and Lacrosse Super Brush Toughs, the differences are noticeable. The Ultimate II Hunting Waders are made with 5mm of neoprene which is thicker than most other cold weather waders. The Ultimate II’s do not have buckle shoulder straps that can cause problems with shouldering shotguns. Instead, the straps are secured with heavy duty Velcro for a smooth profile. The Cabalas Ultimate II Hunting Waders are built with an Armor-Flex outer coating to protect the neoprene shell from abrasions. This fabric coating system is an outer shell of protection not found in most other neoprene waders. The Ultimate II Hunting Waders have a 2.5mm neoprene fleeced line pocket for added hand warmth. The Ultimate II’s cover your entire upper body in 5mm of neoprene. Other chest waders stop around mid-chest high, but the Ultimate’s cover your entire chest and back for added warmth. The boots are made with 1200-grams of 3M thinsulate which is one of the most of any duck hunting wader. With a good pair of socks, these boots will keep your feet warm on the coldest days. The Ultimate II’s don’t have a zipper system that will eventually fail. Each seam is reinforced and heavy duty stitched to prevent leaking over time. The soles of the boots a made with an aggressive design that helps increase grip and reduce slipping on slick surfaces. Here is a great clip of what you can expect with the Cabelas Ultimate II Hunting waders. Adequate insulation for the climate you’ll be hunting in. 5mm or more insulation for subfreezing temperatures and breathable waders for mild conditions or early teal hunting season. Reinforced seams to resist wear and tear over time and to protect against water intrusion in the crotch and leggings. Boot insulation that exceeds the conditions you’ll be hunting in. 1200-grams on boot insulation is ideal for cold weather and conditions where your feet will be submerged for long periods of time. Added protection like knee pads, thigh guards, and protective material to prevent punctures from sharp objects and brush. Added pockets and storage for shells, calls, and other hunting items so that you can keep them close by when needed. Hand pouches to keep your hands warm and dry. A wide range of boot sizes so you can order several sizes larger than you need for extra room and to take into account thicker insulated socks you may be wearing. Camo patterns that fit your hunting situation. This may not matter much if you hunt in duck blinds, but if you’re standing in timber, you’ll want a pair of waders that blends in with the trees. Waders that offer mobility and a wide range of movements will help keep you upright and out of the water. Choose waders that aren’t super tight and won’t restrict movement. If you’re larger, go with the stout or big man version of waders. Duck hunting waders help you stay dry and warm while duck hunting in even the harshest of conditions. They come in a variety of different designs with many different features. They are constructed out of neoprene, plastic, Gortex, and Thinsulate materials. What are the differences between breathable and non-breathable waders? Breathable Duck Hunting Waders – Breathable waders are made out of high-tech materials that allow the transfer of air through material while restricting water. These types of waders reduce the humidity build up inside your waders so you remain dry. 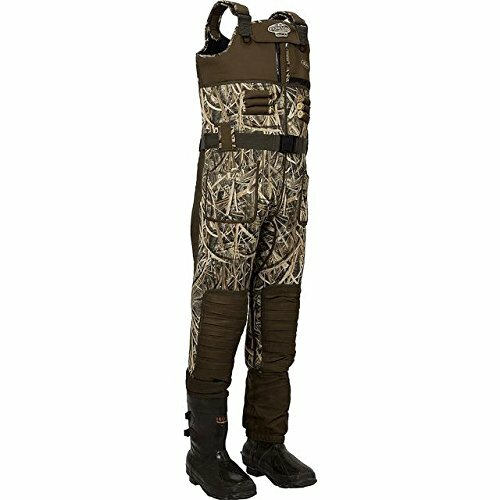 Non-Breathable Duck Hunting Waders – Non-Breathable waders are usually constructed out of neoprene or some other non-permeable material which creates a permanent barrier. These waders are often the warmest since they retain heat the best, but can also cause humidity build-up which can saturate your clothes. I’ve used both breathable and non-breathable waders and my preference is breathable for mild weather and non-breathable for cold weather. Why? Because breathable will keep you drier when it’s hotter out and non-breathable will keep you warmer when humidity build up isn’t a great concern. I’ve hunted with neoprene non-breathable waders in subzero temperatures and they have never let me down. The Cabelas Ultimate II Waders combined with a good pair of socks and wader liners is my favorite combination on cold late season hunts. Early season teal hunts or mild temperatures call for lighter gear and that’s when I’ll wear my Lacrosse Brush Tough Breathable Waders. They still are plenty warm, but they won’t hold the sweat and perspiration inside the waders resulting in soaked clothing when you take them off. If you never hunt cold conditions, then breathable waders will be all you will ever need. Coastal hunting in Texas and Louisiana are the perfect locations for breathable duck hunting waders. How long should duck hunting waders last? This is a common question that always arises when looking for duck hunting waders. From my personal experience, most waders should last 3-4 years of moderate use. Many factors come into play when discussing wader longevity, such as usage level, the conditions you hunt in, and off-season storage. But if you treat them well, they will give you years of use without any problems. If you hunt 90 days a year, expect to go through waders frequently. They just aren’t made to be used that much. Most are designed for the casual hunter who may get out in the field 10-20 times a year. Walking really far through brush and woody vegetation increases the chance your waders will wear prematurely. Crossing barbed wire fences is almost a guarantee that you’ll puncture your waders. Avoiding situations that cause unwanted abrasion will help keep them from leaking. Finally, off-season storage is a big factor in determining how long your waders will last. Storing them in hot attics, garages, or storage sheds will cause them to dry rot and glue to become brittle. Climate controlled storage will keep your waders performing the best they can. Interested in new waterfowl gear for 2019? Check out our review of brand new hunting equipment released for 2019.